With nearly 50 acres of meadows and forests, LaPalme Farm celebrates Acushnet’s natural beauty and pastoral charm. It was once a dairy farm operated by the neighboring convent. Today, hikers can explore more than a mile of trails on a journey through the Acushnet River Reserve. Though it’s located just minutes from bustling neighborhoods in Acushnet, Fairhaven, and New Bedford, it feels like a world away. Discover fields that bloom with wildflowers in summer and peaceful woods that lead you to the gentle Acushnet River. Bring your dog for a walk on the trails, or cast a line into the river to catch redfin pickerel and yellow perch. Download a map of the property here: LaPalme Farm. There is limited street parking on Blain Street. Free admission. The property is owned by the Buzzards Bay Coaltion. 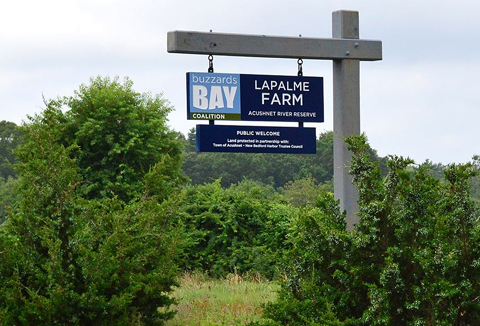 For more information, call 508-999-6363 or visit: http://www.savebuzzardsbay.org/places-to-go/lapalme-farm/.